When it comes to our relationships, the expectation of a perfect union or a bright future of endless bliss is hardly realistic. Whenever two independently willed, unique individuals come together, the journey will never consist of completely smooth sailing. Relationships are full of imperfections and misuses of those close to us, and they are made all the more complicated by the pressure we put on ourselves to merge identities with another person. No two people can ever function as one entity, and attempting to do so is in large part what destroys a healthy relationship. When problems naturally arise, there are ways to fix a relationship. Chances are if you’ve found someone who you really love, deeply care for, and genuinely appreciate (at least a good percentage of the time), then the relationship is worth the effort to repair. It’s possible to drop the baggage you’ve built up along the way and get back to being the two separate people who not only love, but actually like each other. People are full of imperfections. No matter how even-keeled we aim to be, fights, miscommunications, and mis-attunements occur almost every day in a relationship. When they do, we can follow four little steps to quickly repair the situation and get back on track in our relationship. 1) Step away. No matter how hurt you feel in the moment, reacting destructively will only make you feel worse. Rather than react immediately and fall victim to your emotions, take a step back until you’ve relaxed a bit. 2) Calm yourself down. Getting heated only leaves us saying things we regret and exacerbating the conflict. Count to 10, take a series of deep breaths, then decide how you want to react. 3) Communicate. Determine your real point of view and calmly express that to your partner, once the intensity of your reaction has worn off. Then, take time to listen to your partner’s side of the story and try to have compassion for their feelings and perceptions. 4) Drop it. After communicating clearly, resist the urge to build a case or hold a grudge. If you’re willing to be open and vulnerable, your partner is more likely to reciprocate. Have compassion for what your partner is going through and how he or she views the situation. 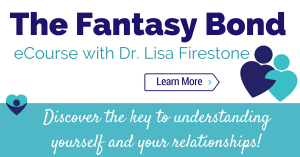 Long-term relationships tend to lose their luster when two people start to engage in a “Fantasy Bond.” A fantasy bond is a term coined by Dr. Robert Firestone describing a state two people enter, in which they relate as a single unit. In this state, the couple stops seeing each other as autonomous individuals. They stop showing respect and love for each other and, instead, relate out of form. When in a fantasy bond, a couple will often start to project onto each other and relate to each other based on projections from their own past. A distance will start to grow, as they stop engaging in acts of affection, love, and appreciation. Instead, they will simply “go through the motions” of being a couple. 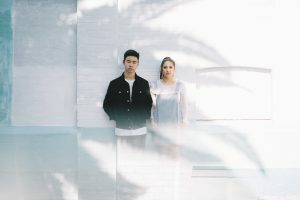 To avoid falling into a fantasy bond or to break free from these patterns, we can think about how we might be projecting onto our partners based on our past. Are you treating your partner as a parental figure? Are you seeing yourself as a victim in the relationship? We tend to recreate old dynamics from our childhood in our current relationships. Identifying these tendencies, allows us to break from them. When we stop projecting onto our partners, we can see them and appreciate them for who they truly are. People often think they want love, but when they get it, they have trouble sustaining the romance and passion they feel for one another. Why is this? Because most people tend to have many (albeit unconscious) fears of intimacy. Overcoming these fears means facing the part of ourselves that keeps us from living fully and experiencing happiness. We all possess an inner critic or “anti-self” that limits us in our goals and keeps us from fulfilling our full potential. This inner enemy is shaped throughout our early lives, through experiences that hurt us or that taught us to be fearful or self-protective. If we felt rejected as kids, as adults, we may feel desperate or insecure in our relationships. If we felt intruded upon growing up, we may resist getting close to someone once we’re grown. Differentiating from these childhood defenses will help us be open to real love in our present lives. Letting go of habits that once protected us, but now limit us, is one way to help us stick it out in a relationship. The more we can live in the present moment, recognizing our fears, then choosing a different path, the better able we are to pursue our goals. 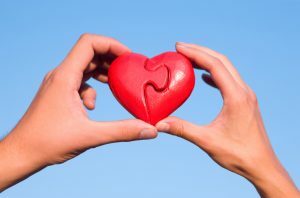 In this same way, the more we understand our “critical inner voice,” noticing when it tells us to be afraid, to protect ourselves, or to push away someone close to us, the more we can resist its directives and accept the love that’s available to us. I am married to a wonderfully loving narcissist man. After listening to him bad-mouth loved ones and friends to me for 6 years, I asked him to stop. I told him that I won’t carry that and that it hurts my spirit. It also hurts my spirit knowing he must be bad-mouthing about me to all those afore-mentioned same people. I chose to focus on his positive qualities because they outnumber his tendency to gossip. Okay fine, that’s done. Now I’m watching him in the process of evicting his 17 year old son. He’s been telling my step-son that he has to move out when he turns 18. My step-son is narcissistic too. The two of them have been a challenge for me to live with. My step-son never considered me mom. I still give him what he allows me to. Never has that been hugs or advice. It’s been rides, food, gifts. Gifts. My step-son’s dad disregards gift-giving occasions; I am the gift giver. Fine, okay, someone has to. It’s a family ritual to me. Dinner together. Since working 1.5 hours from home, I ceased trying to create family dinner time. When I married into the step-family, I did try. Prior to me, the step-kids made their own food or ate at friends or their dad bought them dinner. When home, mealtime was always in front of the television set. I felt it was a “buffer” so there didn’t need to be conversation. Fast-forward 7 years, no family dinner said those here and there for ritual celebrations. My step-daughter lives with her mother 100 miles away so I won’t include here in today’s issue. My step-son lives with us and his threat of moving out in one month since he will turn 18 on Sept. 8. His mother refused to allow him to live with her. She is also a narcissist. My daughter from my first marriage lives with us; she is 23. My rules. Otherwise she’d be kicked out too. I insist she work (at least volunteer) or be in college. She was living on her own between 18 and 22 btw; been back home for 7 months. She is enrolling in classes now for fall. My step-son confides in her since he cannot confide in me (since I won’t hold his secret) and his dad won’t listen to him. I arranged a family meeting; the 1st weekly family dinner meeting I am calling it, this Fri. 7:30pm – 8:30pm. Each person gets to pick one agenda item to discuss. They will hold the talking stick when it’s their turn so nobody can interrupt them or comment. Nobody can give advice unless it’s asked for. My meeting = my rules. Everyone gets to say their piece while they are holding the talking stick. When they are done, they pass the stick tot he next person. Then they get to say their piece (their agenda item). They cannot comment on the previous speaker. My goal is to create a safe circle where each person can express ourself and be listened to without argument, comment or advice. What is said in the circle must stay in the circle. (No gossip.) My goal is for UNITY. That’s all I want.